You may have questions about how hypnotherapy can help you stop or control a gambling habit, hopefully you’ll find the answer below. If you have other questions or would like more information about how hypnosis can help you stop gambling, please call us on 07 3254 1373 and one of our friendly therapists will be happy to answer them. Of course, all calls are completely confidential. Over the years we have helped hundreds of people regain control over gambling and their financial security. Can I respond to hypnosis and why will this therapy help me? The hypnotherapists at New Farm Hypnotherapy Clinic have a combined experience of delivering successful therapeutic outcomes of more than 70 years. In that time we have yet to see a client who wants to experience change through hypnosis and is unable to respond. Hypnosis is a completely natural and very safe state which most people have experienced but don’t recognise as hypnosis. A commonly given example is that of driving and arriving at a destination with no real memory of the journey, this is a form of self-hypnosis that most will recognise as familiar. If you have experienced this state of mind there is no reason to think that you won’t be able to respond to hypnotherapy is a positive way. The Cut Your Losses program will help you change the way you think about gambling. You’ll be able to enjoy going out and know that you won’t be drawn to the gaming room or poker machines. If online gambling has become a problem, when you’ve completed the program you’ll be confident and in control of yourself and your finances. Is this 'an all or nothing' program? That’s for you to decide, but the majority of clients, having completed the program decide that they either can’t or won’t gamble again. They don’t want to put themselves in a position of risk, and that’s a very understandable decision given the money, time, energy and even relationships the’ve lost to gambling. How will I feel after I've completed the program? After completing the program you’ll feel proud of your achievement, better about yourself and you’ll feel in control again. Will my health fund rebate for this program? Some health insurance funds allow you to claim part of the cost of hypnotherapy programs. Any rebate differs between funds and is subject to review by funds on an annual basis. If you have private health cover and a rebate is important to you please check with your health insurance fund. That said, the cost of the program is a small price to pay for breaking a gambling addiction and being in control of your future wellbeing. Have something else you'd like to ask us or need to make an appointment? Poker machine addition has become a major social problem around the world. 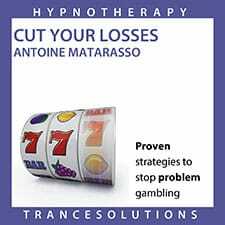 Cut Your Loses provides effective strategies for stopping or reducing gambling, particularly the use of gaming machines. This program will also help you re-evaluate and change negative or unhelpful recurrent thinking, this in turn allows change to begin in the way you will act and react to life’s challenges. Cut Your Losses will also assist in strengthening self-confidence and self-esteem. This audio program is a powerful way to break the gambling habit and build new behavioural patterns, it will help you gain control and stay in control of your life and finances. We use these hypnosis audio programs with all of our clinical clients. They reinforce the work achieve in a session and also minimise the number of sessions that many clients need. People who use the CDs regularly see more rapid results that those who don't make the time. If you have questions or would like more information about how we can help you achieve your goals or make the changes you’d like to, please call us on 07 3254 1373, email antoine@brisbanehypnosisclinic.com.au or simply fill in the form below.